But chemotherapy in pets is very different than it is in people. That’s a good thing. There are some similarities as well. Here’s some facts to help decide if chemotherapy is the best option for your dog or cat. Here’s our most recent podcast where we answer listener mail, then delve into the topic of companion animal chemotherapy! First of all, chemotherapy in humans has different goals than it does in pets. That’s based on the drastically different life spans of our species as opposed to dogs and cats. With people, the goal is to get through a sucky several months, then the cancer is gone, and you can live 30 or so more years. With dogs and cats, they won’t live 30 more years no matter what we do! So the goal is not to kill the cancer dead at all costs. Instead, the focus is on quality of life. Because the focus is quality, not quantity, the veterinary chemotherapy protocols are often less aggressive. We want to put the cancer in remission while giving the pet a good quality of life. Therefore, chemotherapy is not supposed to be awful. We can’t explain to our pets why they feel crummy, and most owners want their pet to feel good for every single remaining day! So most chemotherapy protocols aim to minimize side effects. Of course, we can’t predict how every single animal will respond. Yes, some animals may experience vomiting or diarrhea. The good news – if that happens, we treat it, and we alter the plan so it hopefully doesn’t happen again. In human medicine, the side effects can be awful, and the patient suffers through it and presses on, regardless. Again, the goal there is long term cure. Breeds with ever-growing fur are the only ones who may lose fur from chemo. Yes, vomiting and diarrhea have the potential to happen. The main thing people ask – will his hair fall out? For most patients, that answer is NO! Why? Chemotherapy drugs attack cells in the body that are growing. In humans, our hair grows all the time. 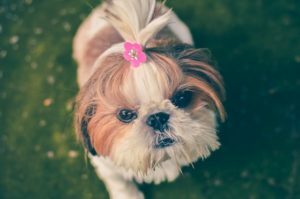 Some breeds of dog have hair like that too – malteses, poodles, shih tzus, any dog who has to get frequent haircuts at the groomer to avoid turning into a mop. However, your boxers, goldens, labs, etc, will keep their coat. They have hair that is not constantly growing, so it is not affected. Full disclosure – we will have to shave a leg (or three) for an IV, and the chemotherapy can impede the re-growth of that hair. Yes, we aim for less side effects, but we still have to monitor for the side effects we can’t see. The big ones – anemia (low red blood cell count) and a low white blood cell count. Why? Again, chemotherapy drugs kill cells that are rapidly growing, and these red and white blood cells have a high turnover rater. Anemia, if severe, can make a pet feel weak and lack energy. A decrease in white blood cells has no direct symptoms, but it makes the pet more susceptible to disease (remember, white blood cells are what help fight infection – that army needs its soldiers!). So, we have to draw blood. A lot. Sometimes weekly, depending on the type of chemotherapy. We also may have to monitor other factors, such as liver and kidney function, even heart function, depending on the drugs being used! Chemotherapy is not cheap. The good news – it’s spread out over months, so you aren’t having to pay a large sum up front like you would a major surgery. And yes, different protocols carry very different costs. Something else I remind people – it’s chemo, not a cell phone plan! You are free to stop at any time if your financial situation changes, or you decide it is just not what you want for your pet. We get it. This one gets overlooked a lot, but is important. Drugs go in, they must come out! Many are excreted via the urine. So, it is important to find out what precautions to take at home. Should you wear gloves for cleaning up urine accidents? How many days before it’s out of the pet? Again, your vet can answer specifics. It’s good to have a family meeting, particularly if you have kids, prior to chemo. Does your pet love or hate the vet visit? I think the main thing in deciding if chemotherapy is right for your pet is your pet’s personality. Does your pet love going to the vet? Are car rides the highlight of her day? Even if he doesn’t love the vet, can he be “bribed” easily with treats? These are animals who often make fantastic chemo patients! If your pet absolutely hates everything about the car ride and the vet visit, then it might not be the best for your pet. It often can require a lot of trips, and if your pet is hating life, what’s the point of doing it? Finally, a frank talk with your vet, or an oncology specialist, should help you decide. Some cancers are wimpy and respond fantastically to chemo (some types of lymphoma and melanoma are examples)! Other cancers are not very effected by chemotherapy, and it’s more of a “hail mary.” The more likely you are to experience success and help your pet, the more appealing chemotherapy can be! It’s important to get all the facts, then decide.